York CAMRA is a branch of the national Campaign for Real Ale (CAMRA). CAMRA is a well-established national organisation with more than 160,000 members which aims to promote traditional real ale and pubs. The York branch covers an extensive geographical area, which includes Selby, Tadcaster and rural parts of North and East Yorkshire, as well as the city of York itself. IMPORTANT. If you are a beer festival organiser or a licensee and have a question for us please check our FAQ pages first, Beer festival organiser, Licensee. Of course if you can’t find what you’re looking for do get in touch. Thank you. Neighbouring us is the Scarborough branch of CAMRA who have their own website. York branch organises a lively socials diary – you can find more details on our website calendar – and all our social trips are open to all. 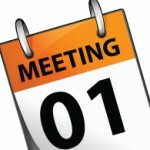 For CAMRA members who want to get a bit more involved, we hold monthly branch meetings in a pub in York city centre. Most months of the year you can find a local beer festival, battle of the breweries or meet the brewer events happening somewhere in or around York. We list all the ones we know of on the local beer festivals diary (if we have missed one off then please tell us!) and some notable Yorkshire and national beer festivals on the national beer festivals diary. 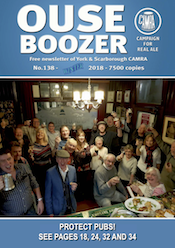 We publish a quarterly magazine, Ouse Boozer, that is distributed free to real ale pubs in the branch area. We organise a beer festival each year in September, held on the Knavesmire near York Racecourse. Planning for the 2017 beer festival is underway. Are you organising a beer festival? Read our FAQ for beer festival organisers page and let us know where and when the festival is happening so we can add it to the diary. Unspoilt pubs — here is your definitive guide to the nation’s most important historic pub interiors. Since the 1960s few pubs have escaped major changes but this website helps you seek out the best historic examples we have left. They range from simple unaltered village pubs to glorious late-Victorian extravaganzas. Each is very special in its own way. 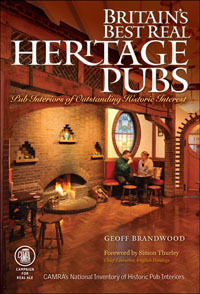 For more information please visit our Heritage Pubs website.